Since our honeymoon in 2013, it has become a tradition for W. and I to go to at least one Formula 1 Grand Prix each year. We’ve been to Abu Dhabi, Budapest, Monza, Austria, Germany, and now to Barcelona. We’re both very passionate about the sport since we were both very young, and have been to other GP’s while we still hadn’t met each other. We don’t miss any race on TV, and even try to be careful not to miss any while we’re traveling. Once, while we were in Istanbul, we stopped our sightseeing to watch the race in a pub, in Casablanca we woke up early and almost skipped breakfast so we wouldn’t miss the race, on our way back from a trip to Croatia we left earlier than planned so we could skip traffic and be home on time for the race. Yup, we are crazy, reason why one day we plan on taking a trip following all the races of the Formula 1 calendar. 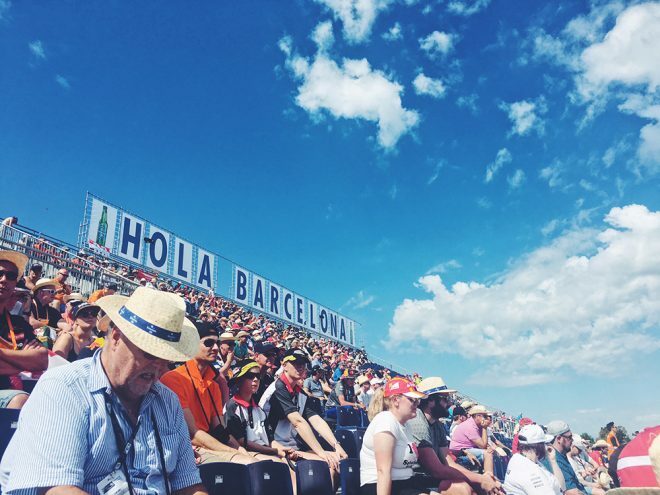 But while that day doesn’t come, let me tell you what we thought about the Formula 1 Grand Prix in Barcelona 2017. 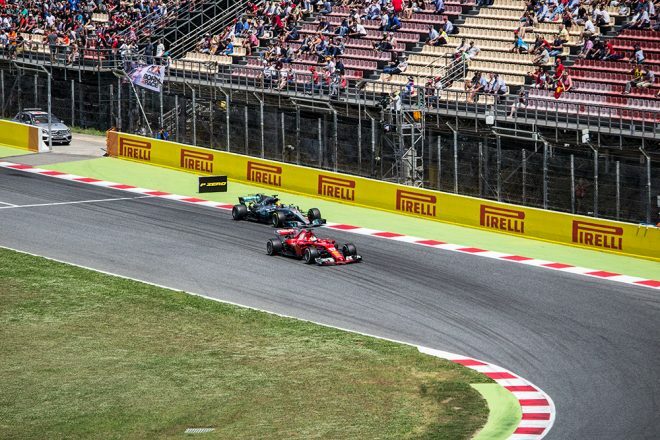 Formula 1 drivers have raced at the Circuit de Barcelona-Catalunya every year since 1991, the track is also where the teams test their cars before a new season starts, between end of February and beginning of March. It’s not an easy circuit for the drivers, and every race is always full of emotions and surprises. The race happens every May, being the first Grand Prix in Europe during the season, and it has one of the most affordable tickets of the calendar. The weather is almost always great (and hot). 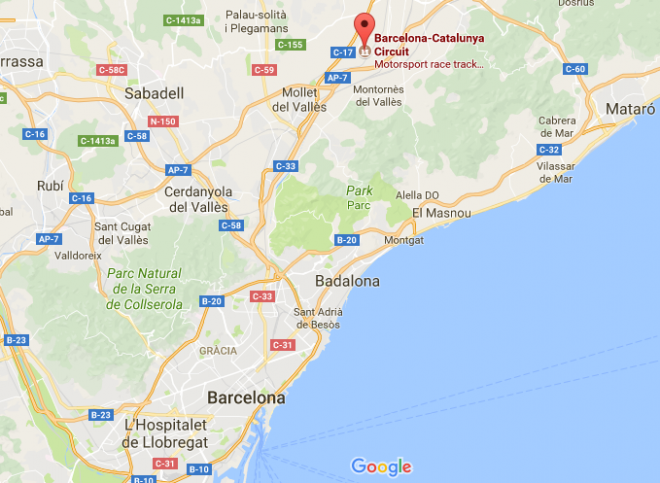 The circuit is located only 32km from Barcelona and 18km from the Spanish coast, and offers very easy and effective access at the race day. The circuit offers great infrastructure, and it’s very organized. From the access to the parking lot, the seating places (most are uncovered), bathrooms, cleanliness, food and drink options, security, to open areas where it’s possible to enjoy a little bit of the shadows under the trees. I was very happy with the cleanliness of the circuit, there was always someone emptying the trash (know that in some circuits the lack of cleanliness can be very annoying, like in Monza), there was always paper in the toilets, which impressed me the most, and if you see garbage on the floor that’s mainly the fans themselves to blame for. I was over all very happy with the bathrooms, especially considering that I was pregnant while attending the race and had to go several times to different ones. Lines were easily avoidable, there was always a staff organizing and cleaning them, and as mentioned above, there was always toilet paper. The only problem was drying your hands, but the weather was so hot that I didn’t mind having my hands wet for a few minutes. As in every circuit, the food is a bit pricey, and options are a bit limited (Hockenheim was an exception for me). They serve hot dogs (for around 5 Euros), sandwiches, fries, ice cream, and in some stands you can find paella. The only weird thing and what most fans complain about, is that no alcoholic beverages are sold at the circuit, and it’s also prohibited to bring them with you. This year they sold Heineken alcohol free beer and for an unbelievable expensive price. 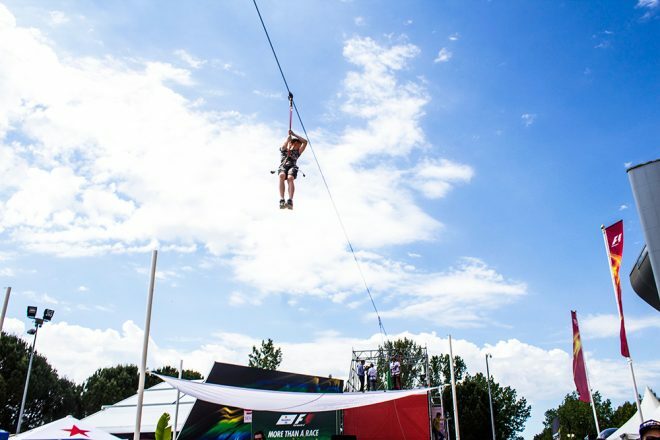 The Fan Zone has been gaining popularity ever since it started a few years back. It’s one of my favorite areas, and I always stop by in every race we go. 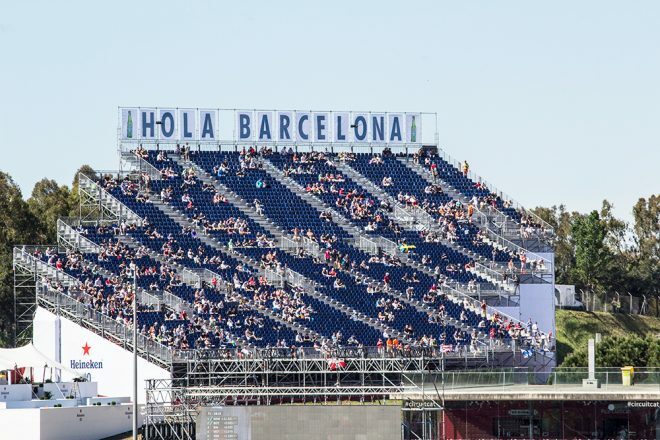 The good news is that it’s expanding and improving, this year they started the new Fan Zone in Barcelona, with more additions to the last attractions. Now, it’s also possible to take part in a pit stop simulation (the pit stop challenge), in which you change the car tires, pretend that you are on the podium and get a picture of yourself, hospitality lounges, and even to adventure yourself up in the air above other fans’ heads! The Circuit de Barcelona-Catalunya is located 32km away from Barcelona, in Montmeló. You just need to follow the C-17 road (exit Montmeló), or the AP-7 highway (exits 13, 14 and 15). The exits 14 and 15 connect to the C-17 road. It’s possible to get to the circuit by bus, train and AVE, though in my opinion only the first option makes sense, as the others you need to walk 45 minutes from the station to the circuit! 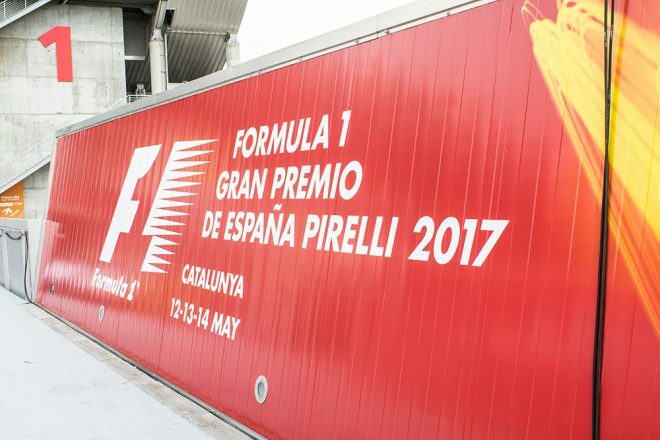 Bus: during the Grand Prix there is a special service bus that leaves from Barcelona city centre to the East area of the circuit. The return ticket costs 12 Euros, it leaves from the North Bus Station in Barcelona, and the trip duration is 45 minutes. You need to book these tickets with Sagalés or the Tourist services section for special services on race days. 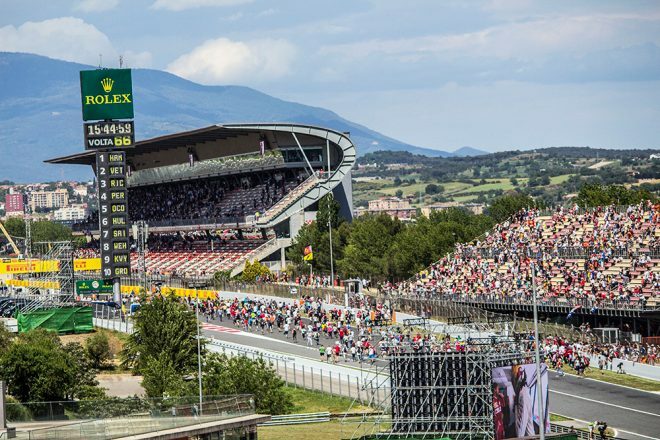 For more information on how to get to the Circuit de Barcelona-Catalunya, check the official website. Of all the circuits we’ve been so far, the Circuit de Barcelona-Catalunya offered the best parking. In terms of both organization and being near to the entrance. The parking costs 15 Euros for the entire weekend. Once you pay, you get a tag to leave inside your car, this will guarantee your space in that given parking lot for the whole weekend, which means on race day you won’t have to waste time waiting in line to get a place. We got our tag already on Thursday, as we went for the Pit Walk. In terms of which parking lot you should park, you just need to know where your seat is and use the map offered by the circuit (normally it comes with your ticket) to find the closest one. As in every Grand Prix, accommodation near the circuit is hard to get and very overpriced. If you don’t manage to get anything near the circuit, don’t worry. You can stay in Barcelona or anywhere near the motorway, but know that during the F1 weekend accommodation is always a bit more expensive than usual. ♦ You are not allowed to take any glass or can bottles with you to the circuit. Plastic bottles are allowed, however with up to 500ml, otherwise it will be thrown away at the security check at the entrance. 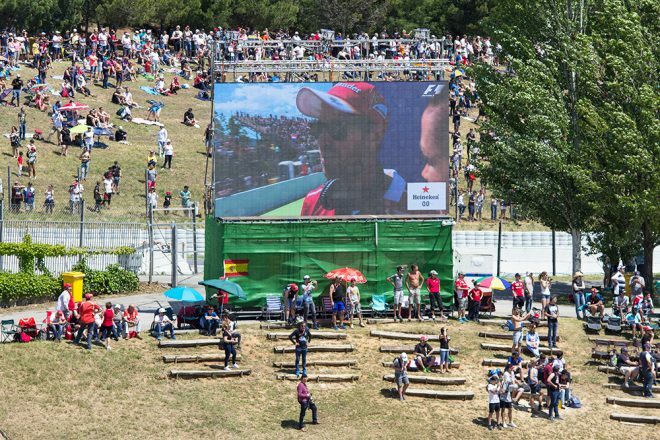 ♦ You are allowed to bring food to the circuit, and I definitely recommend you to stop at the supermarket or bakery to get some snacks and water for the race. ♦ Backpacks are also no problem at all. 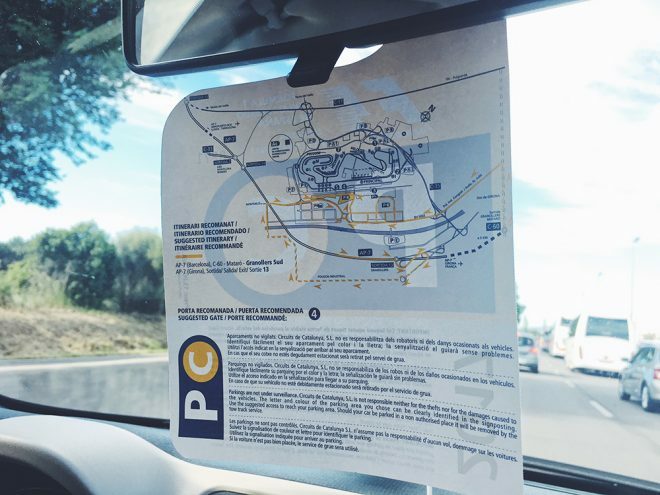 ♦ If you have a 3-day ticket and are driving to the circuit, do go as early as Thursday/Friday to get a sign for your car for the parking lot, this way you will save a lot of time in traffic trying to park your car on race day. It costs 15 Euros for the whole weekend and it’s guaranteed that you will have a parking space in that given area for all 3 days. ♦ If you still have no idea where to pick your seat, I highly recommend you to stay anywhere on Turn 1. There is where all the action happens, the coolest over takings, mistakes and crashes. 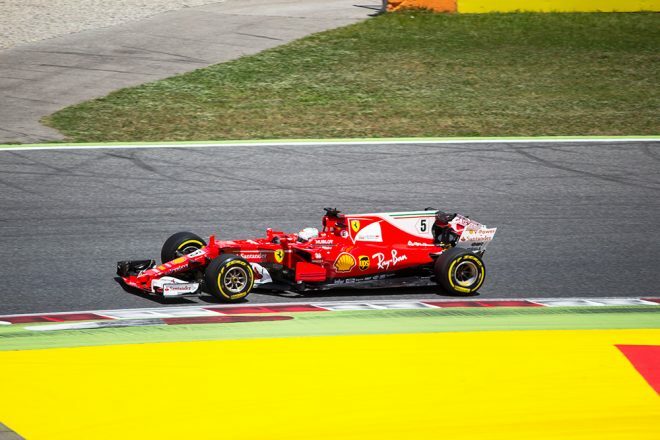 → More Formula 1 Grand Prix packing tips here. 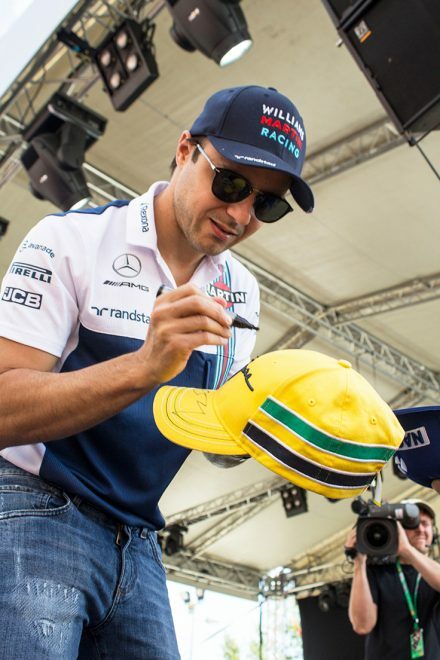 Without any plans or expectations, while I was photographing the fan zone I stumbled upon F1 driver Felipe Massa giving an interview at the main stage, and managed to get his autograph! This post contains affiliate links. 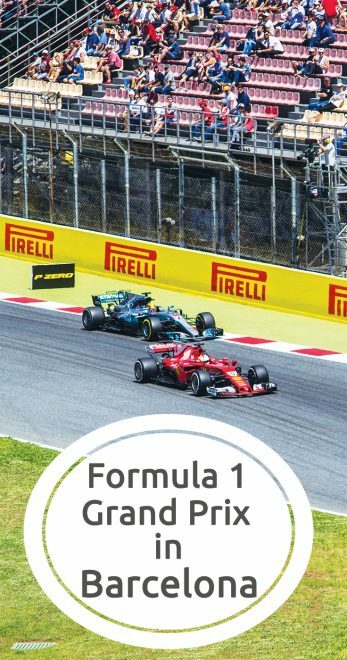 If you buy any Formula 1 tickets via the link provided on this post, we will earn a small commission and at the same time it won’t cost extra for you. The suggested company is the one where we always buy our own tickets every year, bookf1.com. Hi Ray, I know, right? We thought it was pretty weird too. It was the first circuit we went to that didn’t sell alcohol. Not sure why!